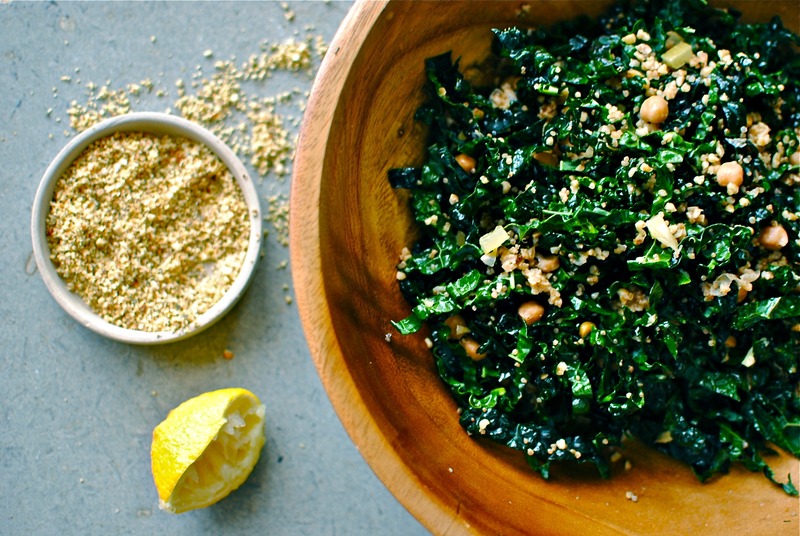 Lemony Kale, Quinoa and Chickpea Salad with Vegan Parmesan Cheese: mouthful of a title, mouthful of a meal. Today’s recipe is all about preparing us nutritionally for the inevitable. Even if you don’t personally celebrate Christmas, it is nearly impossible to avoid the OTT decorations (love them) and the ceaseless tide of festive food. Sure, there are wooden crates of glowing clementines and piles of fresh in-shell nuts to help keep us on an even keel, but it is small beer compared to the piles of mince pies and boxes of special offer candies that one literally has to push past to get to them. In some stores entire aisles are lined with sugar. It takes nerves of steel and a will of iron to negotiate the commercial traps laid in the supermarkets. But when you make it past, head straight for the produce aisle and grab some kale – or whatever dark leafys that you like – and a couple of bags of nuts, and make this salad. It is super filling, easy to pimp with your favourite goodies, and hits the savoury, salty spot. I have eaten this version, more or less, off and on for over a week and I have yet to tire of it. Especially when I found out the latest in a long line of good news about nuts. Even when the anti-fat brigade was at the peak of its influence I think many of us knew that plain old nuts were good for us. And boyhowdy are they. It seems that people who eat nuts live longer. That’s a bold statement that probably needs more large studies to back it up, but a peer-reviewed study of 120,000 (ie, big) women and men has found that the more often they ate nuts, the lower their risk of dying over the next 30 years. Although eating an ounce of nuts per day was linked to a 20% lower risk of all-cause mortality, a 29% lower risk of death from heart disease and 11% lower risk from cancer death, even once a week nut eaters were 11% less likely to die of any cause over the study period. So you don’t even need to LIKE nuts that much. Wow. 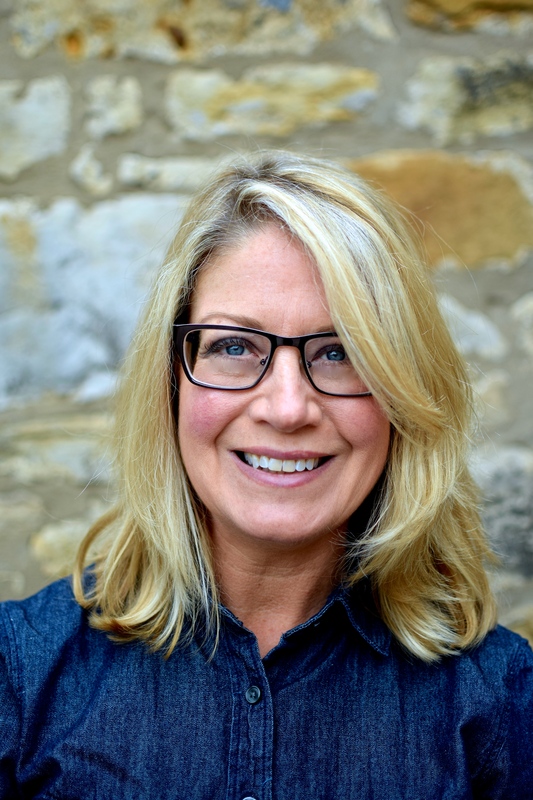 Something enjoyable, affordable and doesn’t require willpower can help us live longer? I’m in. And, another finding from this study by the Dana Farber Cancer Institute (sponsored by the Tree Nut Council, but still…) is that nut eaters are slimmer than those who don’t partake of the ol’ protein and fibre powerballs. Right, that’s it. I don’t need more convincing that I should eat nuts every day.What about you? To get you going, instead of using Parmesan cheese for the usual kale salad, how about making my homemade vegan parmesan cheese? 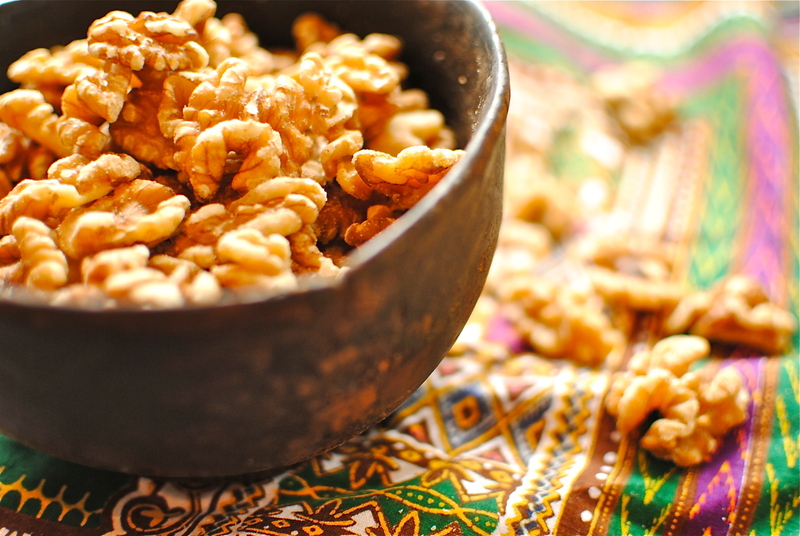 It’s nutty and savoury and more than a little like the real thing. There is one small snag though: you need nutritional yeast, or ‘nooch’ as it is sometimes called. I know it sounds well-yuck, but trust me, if you are anywhere close to being at least a part-time vegan you will want this in your life. Nay, need it in your life. It is a deactivated yeast made from a single-celled fungus grown on molasses (this just keeps getting better, huh? ), meaning it won’t froth up or be useful in baking. What it will do is impart a lovely cheesey flavour to anything to which it is added. Really. Susan over at FatFree Vegan Kitchen has written an excellent post on the whys and wherefores of nutritional yeast, so go visit if you need a course in Nooch-ology 101. I know it sounds weird but I have taken to using it loads. 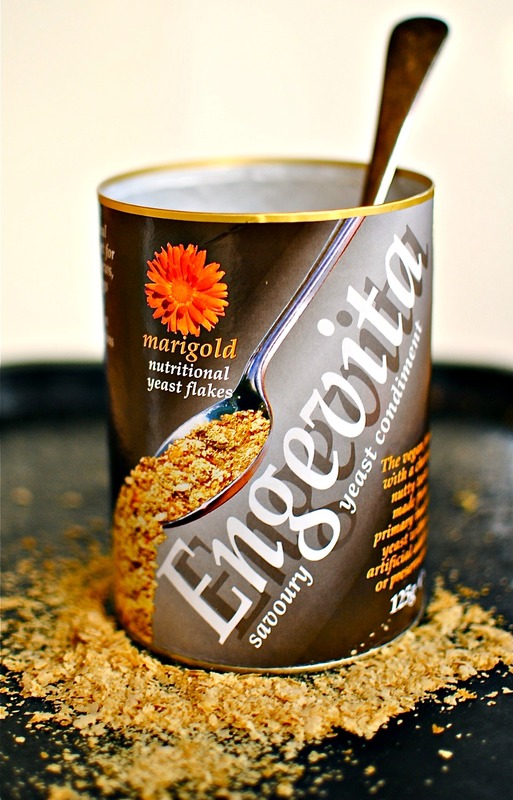 Here in the UK, Marigold sells it under the name Engevita, and you will find it in any health food shop, or on the Internet. You can even get it fortified with vitamin B-12. This type of yeast is safe for anyone to use. In summary, nuts are fab, nooch is the bomb, kale is still my BFF. How about you? Are you nuts for nuts? New to nooch? Crazy for kale? Do tell. Vibrant tastes and textures, and filling to boot, this salad is great on the day but keeps well too. Use whatever kale you have – or even shredded Brussels sprouts – but cavolo nero (aka lacinato, black kale, Tuscan kale, dinosaur kale) is best. I’ve used preserved lemons to heighten the lemon, but use lemon zest and plenty of lemon juice if you don’t have any. This salad is also really nice without the quinoa and chickpeas – just not as filling. 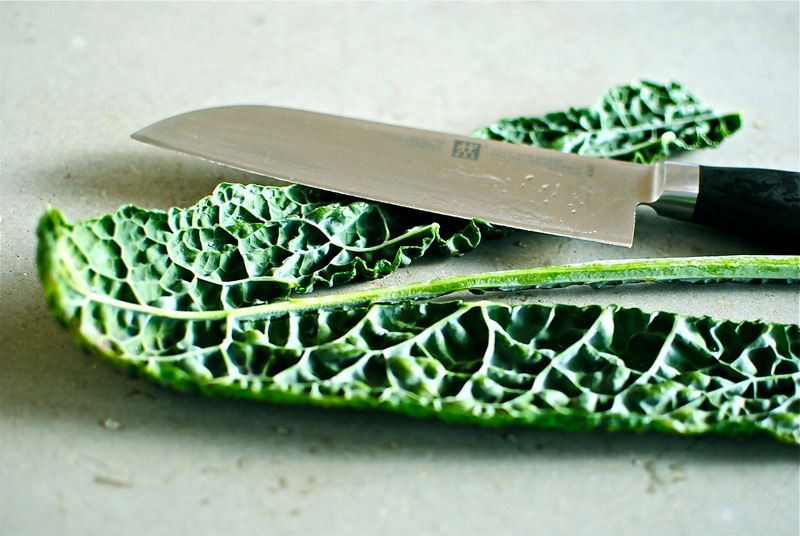 Take a sturdy knife and cut along either side of the white, thick ‘rib’ of each kale leaf; remove the rib. Pile the kale on top of each other in small batches and slice into thin ribbons; place in a large mixing bowl. Pop the garlic and a couple of pinches of salt in a mortar and pound to a paste with the pestle. Or use the side of a heavy knife to crush the garlic and salt into a paste and transfer to a small bowl. Whisk in about 4 tbsp of good olive oil until it gets thick, then add in the lemon juice. Scrape the lemony, garlicky dressing onto the kale leaves and massage in with your hands, making sure all is well-coated and glossy. Toss in the cooked quinoa, chickpeas and diced preserved lemon – or zest of one lemon, and grind in some fresh pepper. You could also saute the kale briefly and then dress the salad as described. 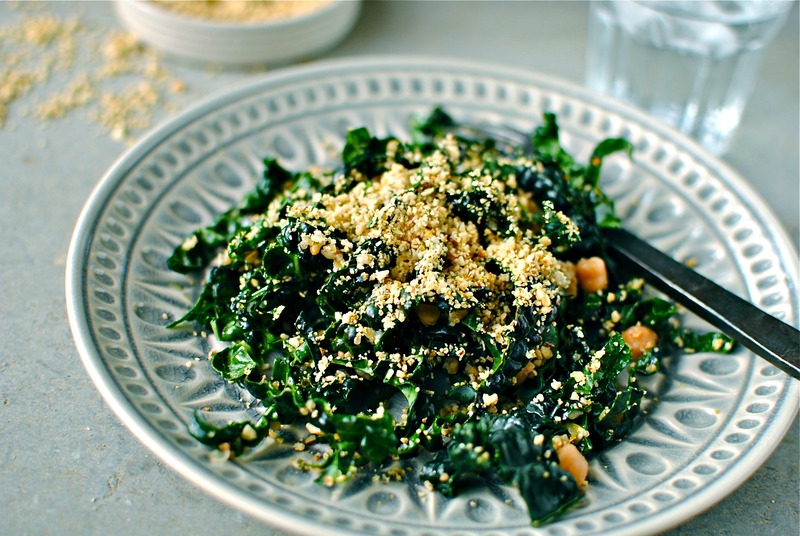 Decant the kale, quinoa and chickpea salad into a serving bowl and strew with plenty of nutty, savoury vegan parmesan. Serve with extra ‘cheese’ alongside: it is super tasty and more-ish. *if you like, use ready-to-eat pouches for ease/immediate salad eating. Many supermarkets in the UK carry good combinations of pre-cooked grains and pulses. I looked at a few recipes but settled on my own version, with a good dash of garlic powder and quickly dried lemon peel – gorgeously savoury and healthy. It will keep for at least week if kept in a cool, dark place. Use it on pasta, in bakes, in salads, as a topping for soup and flatbreads. 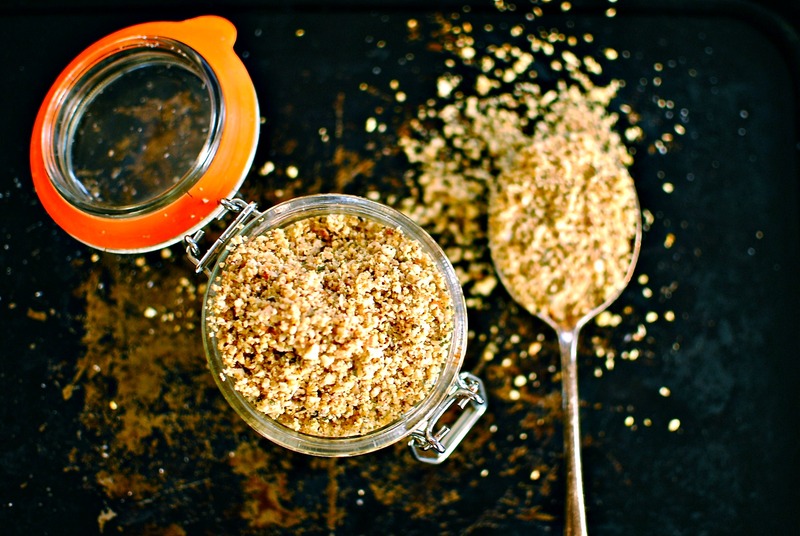 It is great used as a ‘dipper’ for bread and raw vegetables, like you would with dukkah. I love it as a topping for my favourite breakfast of wholegrain toast, smashed avocado and chopped cherry tomatoes. This, dukkah and za’atar are my favourite instant flavourings. It is not exactly like cheese, but certainly does a pretty good job of imitating the savoury umami-ness and slight tang of good Parmesan. Place the nuts and seeds on a baking tray and toast in a 170C/340F oven for three minutes; add the lemon zest to the tray and toast for a further three minutes. Let cool for a couple of minutes then grind in a mini food processor/food chopper. You want it nubbly like small gravel. Now add the remaining ingredients and grind some more until it looks ‘sandy.’ Taste and adjust the flavours, although they intensify with sitting. Store in a lidded container or jar; keeps for about one week in a cool, dark place. Hi there. Here in the UK they are two different but very similar things: one a by-product of brewing, the other specifically grown on the molasses plant for use by vegans. I haven’t tried brewer’s yeast so don’t know how they compare taste-wise, but it sounds like if your soup was such a hit in replacing cheese with it then b/y must be great stuff. Thanks so much for your comment and suggestion. Maybe some people would only find brewer’s yeast so it would be a good alternative to the nooch. This looks great especially the vegan cheese – I’ll have to give it a go. I do a kale and chickpea salad with sumac so good to have another taste with those core ingredients. I haven’t even looked at the recipe yet and I already know I want it!! Talking of nuts, I just made your ‘no bake jaffa cakes’ this evening for Mel to try tomorrow – she is coming round for a Vitamix demo 😉 and I remember you recommending the turmeric properties for her so yes, thanks, we will be getting a cashew fix tomorrow 🙂 – long live nuts! ps I always have nuts in my handbag. I know what i’m cooking for dinner tonight! This is just absolutely amazing! 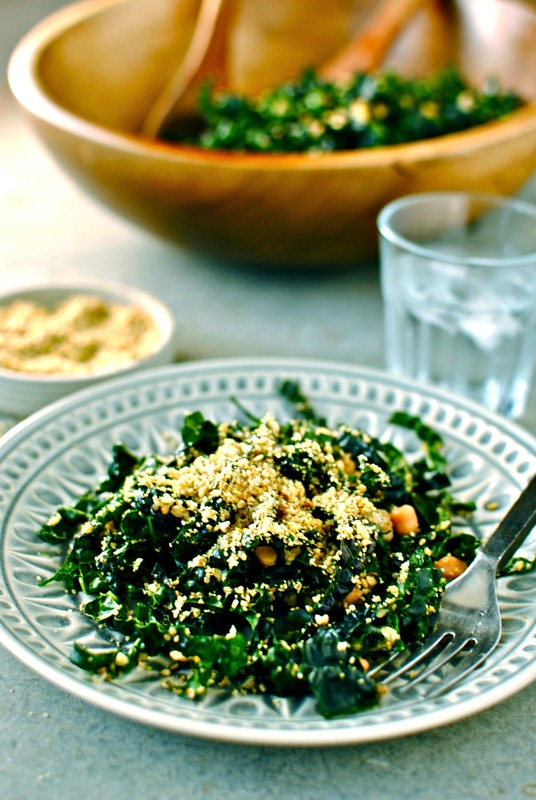 Kale, quinoa and chickpeas, three of my fav ingredients! Must try asap! This looks so amazing – gourmet and comforting! Yum! This recipe looks very special, and I love the cleverness of the “parmesan-non-parmesan”! I’m with you, Kellie, I was *thrilled* to see the results of that nut study! I’m generally pretty good at avoiding the holiday temptations in the grocery store, but the holiday parties and thus holiday eating started for us 2 weeks ago, and so I’ve been trying to keep it as light as possible during the week. As usual, you and I are totally in synch – next up on my list is a roasted kale and butternut salad. I love the idea of your vegan Parmesan, though I don’t normally bother – I like sprinkling nooch on my salads and veg (and popcorn!) just straight up. Yum! The hummus was delicious and I am just about to make another batch. The best bit is that I get to use a by-product of making my milk as the basis for my lunch. Cavolo nero was the kind of kale that I tried to grow but it just didn’t work here. I know that Russian kale and curly kale grew well in town so I might have to give them a go. Wow, you weren’t kidding! That is awesome news for nut lovers. I LOVE Nutritional Yeast and Kale so this sounds pretty awesome! Well, now…that’s about the prettiest nutritional yeast I have ever seen! And, since kale and I are still BFFs too, I can’t wait to make this healthy, yummy looking dish 🙂 Love the “looseness” of the ingredients too! Thanks so much EA. I think I am approaching overload on the kale blogging, but I will still be eating it even if I don’t write about it. I think I really am addicted!